A few wildflowers poked their heads out of the ditch in front of the home, where a crew from Michigan painted siding, installed extra wall supports, and prepared for drywall installation. In a down-to-the-studs interior space, a team member explained the new kitchen layout to the homeowner. A Rio Texas project manager unloaded yet more supplies just procured from the hardware store. So why is a team from First UMC in the small town of Midland, Michigan (pop. 42,000) all the way down here in Rockport? As unbelievable as it sounds—because one member of their small Michigan congregation is originally from First UMC in Portland, Texas. Last fall, senior pastor Dr. J. D. Landis of First UMC in Midland felt a burden on his heart. “We had recently experienced a lot of flooding in Midland and sent lots of people to help. Then we heard about Harvey and Puerto Rico, and I felt that we needed to act. “I felt very connected to Texas especially, because I heard that it experienced some of the worst flooding our country had ever seen. I also thought about how Texans had shown so much compassion for the displaced from Hurricane Katrina. I felt we ought to reach out and show that same love to those who were now facing that same terrible destruction. So one Sunday, I issued a challenge to our congregation to do something. “After the service and totally unbeknownst to me, I learned there were two people in the congregation from FUMC Portland, Stacey Hall and her mother. Stacey’s daughter Robin is a member of our church, originally from the Portland area. Stacey told me afterwards, ‘We couldn’t believe you were talking about Harvey. We felt like you knew we were here.’” Stacey helped J. D. make a connection to the Rio Texas Conference to arrange for a work team, and planning began. The team formed quickly. “Four people volunteered right off the bat, and it then snowballed to 13,” said J. D.
“We probably had the most skilled labor team you’ve ever laid eyes on,” he continued. 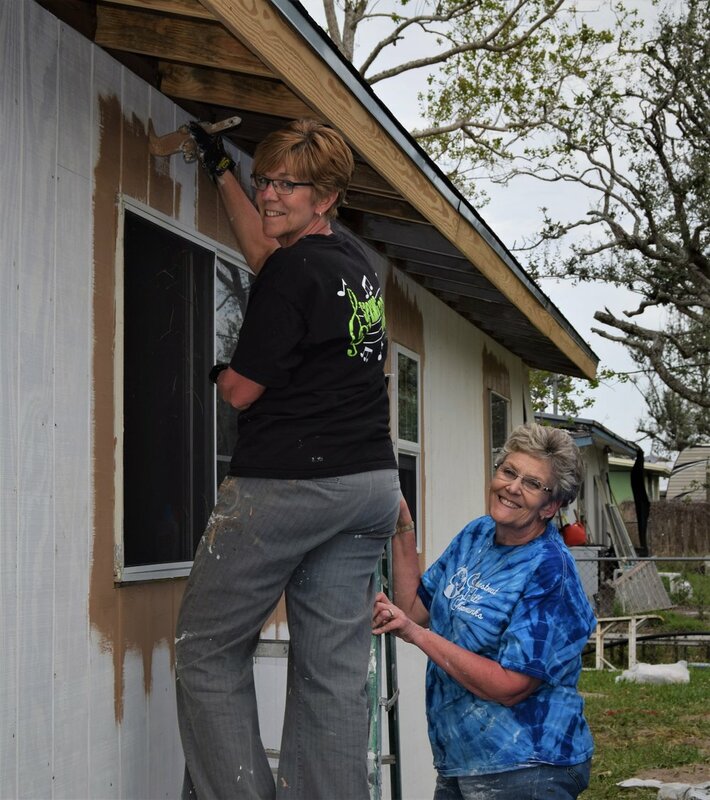 One team member was a former high school shop teacher and woodworker and has led builds for Habitat for Humanity for decades. Another is a retired contractor. “We probably had six people who could have led their own mission trip. That was a blessing because it meant we could accomplish a lot. “What impressed me the most is that a lot of the FUMC Portland people were making repairs for others when their own homes and their own church still need work,” he said. J. D. made a point of thanking local congregations. “The hospitality of the churches of Rockport, Sinton, Portland, and the Conference was phenomenal. During our trip, we used FUMC Rockport for dinner and evening programs and stayed at the Volunteer Village at FUMC Sinton at night. It was a blessing to connect with local churches.